Do you ever have anger guilt? 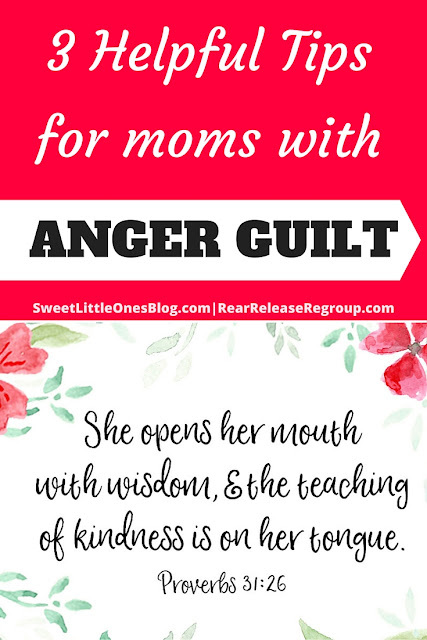 Most moms experience anger once in awhile (if you don't, I'd like to shake your hand). However, did you know that anger is a validated emotion from God? If you've always been under the assumption that your anger is wrong, I'd like to invite you to take a second look. Anger in and of itself is not wrong - even God experiences anger. The Bible is full of instances where the children of Israel received justly due punishment for sin due to God's righteous indignation. Anger can propel us to act for justice, protect the innocent, and fight for equal rights. Anger over losing a child as a result of a drunk driver spurred one mom to found MADD (Mothers Against Drunk Drivers), and anger over the murder of innocent unborn children triggered the Right to Life movement. Anger over the injustice of child abuse impelled me to begin seeking ways to help moms deal positively with their anger. Anger was given to us by God to act in positive ways against wrongfulness. When you are angry at your children because of their disobedience or unfair treatment towards siblings, that is validated. God wants you to use your anger to set things right. So yes. Correct your children, right the wrongs, do not put up with bad behavior! However - anger turned to wrath is what gets us into trouble! Erupting all over the family, screaming, yelling, hurting with words, or even worse, harming your children, is wrong. This is where the fruit of the Spirit - self control - comes into play. And in order to develop the fruits of the Spirit, we must be walking in the Spirit and abiding with Christ. Take time to abide today. Read Scripture, pray, and maintain an attitude of prayer. Pray for discernment when your anger is sparked due to the wrongful behavior of your children. Post Scripture throughout your home where you'll see the reminders often (window sills, bathrooms mirrors, etc.). Even if you only have a few minutes to meet with the Lord, it is still very necessary and goes a long way toward building positive behavioral habits. What we make time for shows our priorities. Do you have time for Facebook? Instagram? Exercise? Eating? Make time for God in your life and you will experience real, meaningful changes! We must fight sinful behavior with our most valuable weapon - God's Word and prayer. Here is a verse for your window sill (and your memory)! The next time your anger is sparked, use it to craft wise words of healing and correction. God will help you! 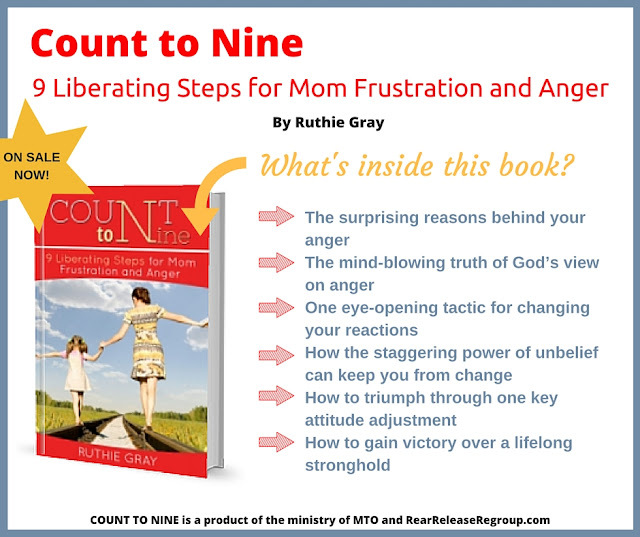 My new book, Count to Nine: 9 Liberating Steps for Mom Anger and Frustration, presents nine essential steps to overcome wrath-induced anger. Offering Scripture Pillars (ACTION verses), Power-Packed Pillar Prayers, a plan of attack for each chapter, and much more, this book will set you on the road towards recovery. The book is full of key Biblical strategies to help you parent gracefully and learn the Biblical approach to anger. How do I know? 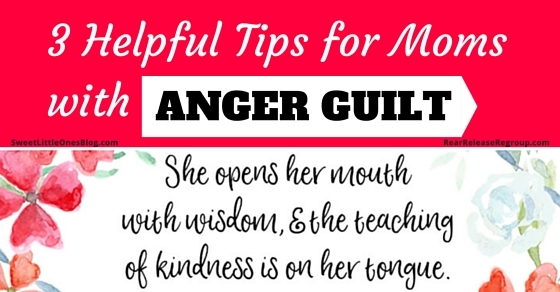 I teach this method to a group of moms, and they are seeing the wins by overcoming wrath-induced anger and instead, steering anger in positive directions! Count to Nine is a small investment to make toward a big difference in the dynamic of your family. Are you ready to take the necessary steps to freedom and let God control your anger? Count to Nine: 9 Liberating Steps for Mom Frustration and Anger! How do you feel about the topic of anger? Have you always viewed anger in a negative light? Ruthie Gray is a wife, mom of four, Gigi, and caregiver, living in the sandwich generation and blogging to keep her sanity. When she's not snacking on plastic drumsticks with her grandson (The Tiny Tornado), or snuggling his sister (Baby Cakes), you can find her coaching other moms on how to raise responsible kids and enjoy them at Rear. Release. Regroup. and Mom Time Out. You can also connect with Ruthie on Facebook.